SEO Software. Content, Ranking, SEO Search, Live Help and more SEO software. Designed in house. Our impressive customized SEO Software package Web Auto Content Feeder is already #1 on Google, once put in place on your Website begins to work building new pertinent content on your site, automatically. SEO Web Auto Content Feeder automatically starts feeding new, pertinent fresh content on your website on a scheduled and predefined basis. The content can be provided by you or SEO content can be created by our in house team of SEO Copywriters and easily placed via an admin. control page. To achieve maximum SEO advantages of this program, our copywriter's will write and produce content under your direction which will include important hyperlinks both within the website and to other sites of authority. Automated reminder system. Sends email to alert hen SEO content is running low, usable defined. Your website fresh new content will be placed in a predetermined spot on your home page in a CSS box or wherever it will have the most impact. The content will contain the important keywords and keyword phrases that have been determined you would like to achieve top Search Ranking and to archive top exposure, top ranking and top click through traffic to your website. GetMeOnTop SEO Web Auto Content Feeder also automatically builds and incorporates an "Archive" page on your website, where each of the past pertinent content pieces will flow automatically.. The archive page will allow the search sites to automatically spider and include the content in their index of web pages. The Archive page will grow in perpetuity, completely automatically and on its own as the new content automatically feeds onto your website. SEO Web Auto Content Feeder is the results of more than six months of development and 1000+ hours of programming time, resulting in one of the most and has resulted in the most incredible effective tool SEO tool available anywhere at any price. This SEO software package can easily be added to any site that has .php and is revolutionary, its features allow the addition of fresh, pertinent content and keywords to your home page and archives by building a new page on your site loaded with content on your website each and every day it is updated. The SEO Web Auto Content Feeders SEO and rank building features will increase your search ranking and search page position (SERP) and add important keyword rich pages to Google Search Index as well as Bing, Yahoo and Ask.com exponentially. As Google indexes your content, your site will be continuously building links and Search Rankings, you will begin to quickly notice and increase your websites exposure, top search positions, Page Rank, and your important keywords and search terms will be found at the top of Google, Yahoo, Bing and other search sites. If you are looking to increase the exposure and traffic to your website, ask us about SEO Web Auto Content Feeder will help you be #1 in Google with tons of additional web traffic! 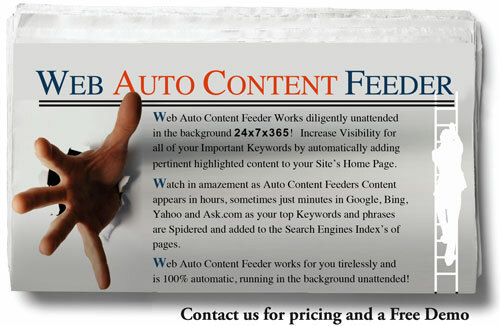 SEO Web Auto Content Feeder is a website add-on software program and is a constantly improving SEO tool. As new features and improvements are established and added we will roll these out to you as provided by your maintenance agreement. Take a look at our other amazing SEO tools, all developed with one thing in mind achieving top ranking in all the search sites. #1 on Google 6 months straight for our top 10 keywords! Are we happy, well heck yeah! We had tried for well over a year, read SEO books, took SEO webinars, even had a so called SEO expert show my people SEO tricks and tips. The problem is, they are not web developers and do not have the gumption to do what needs to be done each and every day to be #1 on Google. GetMeOnTop SGetMeOnTop SEO and Web Marketing company in Manhattan NYC obviously knows what is involved in getting sites to the top. We found GetMeOnTop by searching Google. They seemed to come up more often than anyone else. We figured that if they are on top, who better to helps get to the top of Google as well. We were right! The traffic to our website and daily orders have increased tremendously. Their services are worth every penny. I can't say enough good things about GetMeOnTop. Higher them, you will be very happy!